The north coast of Cornwall offers some superb surfing beaches. Obtain expert advice if you plan to learn to surf, it can be dangerous. Chapel Porth, Atlantic Coast. Some of the finest waves in Europe can be found at Chapel Porth beach. Lifeguard service operates daily May - September. Crooklets Bay Bude, north Cornwall, offers beachbreak waves and is home to the Bude Lifesaving Club. Recently used for flloodlit competition. Lifeguard - seasonal. Duckpool, Bude, north Cornwall, in superb setting famed for spectacular sunsets. Shingle, faces west, not suitable for beginners. Lifeguard - seasonal. Fistral, Great Western and Tolcarne, Newquay, Premier surfing resort. Standard of surfing is high especially at North and Fistral beaches. A state-of-the-art surfing centre is under construction. Lifeguard - seasonal. Perranporth, Atlantic coast, near Newquay. Long beach, 2 miles of sands. Beginers - intermediates. Surf Lifesaving Club which takes part in national and international competitions. Lifeguard - seasonal. Polzeath on Camel estuary in Hayle Bay, Atlantic coast, west facing beach that picks up swell. Suitable for all surfing abilities. Lifeguard - seasonal. Porthmeor Beach, St. Ives, popular for its close proximity to the town. Facing north/north west. the beach offers waves that are suitable for beginners to intermediate. Lifeguard - Seasonal. Widemouth Bay, Bude north Cornwall. Wide sweeping beach, main surfing beach in the area. Works best from mid- high tide. Lifeguard-seasonal. Town of Bude offers a range of facilities. The Dolphin Surf School 17 Eliot Gardens (www.surf-school.co.uk) offers tuition with all in prices for lessons, equipment and wetsuit hire. The Reef Surf School, 27 Agar Road (www.reefsurfschool.com) has similar deals. 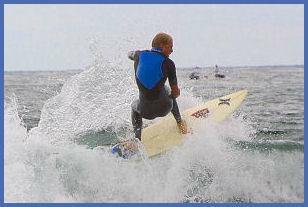 Blue Wings Surf School (tel: 01637-874445) provides lessons and several shops supply and hire all the equipment. The Portmeor Beach Cafe and Surf Centre (tel: 01736- 793366) offers tuition and equipment hire. St. Ives Surf School, Portmeor Beach, (tel:0966-498021) offers tuition and equipment hire. Outdoor Adventure Multi-Activity and Surf School www.outdooradventure.co.uk offers surfing tuition.